It wasn’t meant to end like this. Not this way. Anyone with half a football brain knew that whatever unifying effect the fallen Neymar may have had on the Brazilian team, it was unlikely to be enough to beat Germany. To lose a close-fought match is one thing but to be so completely and utterly humiliated, not only by the ruthless brilliance of your opponent but also through your own staggering incompetence, is quite another. For it to happen to Brazil of all nations? In a World Cup semi-final? At home? It still beggars the imagination. And yet, being in Brazil these past few weeks there was a sense that while organisers had been frantically papering over the obvious cracks in the infrastructure, Luis Felipe Scolari had been doing much the same on the field. Neymar’s luminescence couldn’t completely conceal Brazil’s alarming shortcomings in defence and with Thiago Silva’s absence, the whole thing unravelled. In their increasing desperation to erase the ghosts of 1950, they sowed the seeds of a disaster that will long outlive the Maracananzo in infamy. Has there ever been a more shambolic defensive display at this level than that of David Luiz, Maicon, Marcelo and the ironic Dante? An inferno indeed. Incredibly, of course, David Luiz’s transfer to Paris St Germain has just made him the world’s most expensive defender. I do hope they kept the receipt. Watching the game was a strange experience, going from surprise and shock to eventual embarrassment and nervous laughter. The Brazilian fans, who to their credit stood and applauded their German conquerors, probably felt much the same and it is they who I really feel sorry for. Whatever unrealistic expectations they may have had of their clay-footed heroes, their infectious joy and emotion, and generosity to visitors, has done much more than any confected FIFA hype to create a truly memorable tournament. I have no doubt that there will be much anger among them now, which may increase to dangerous levels once the final is finished on Sunday. The irony of one cruel joke doing the rounds – that this was Brazil’s biggest World Cup loss since paying for this one – will not be lost on them. Victory would not have assuaged any of the deep socio-economic issues that afflict this beautiful country but on a football level it mattered. It really mattered. For all their big fat salaries and sponsorship deals, this defeat – and indeed the manner of Germany’s victory – was a reminder to the big name players that this is what the game is truly about. As Danny Blanchflower, captain of the famous Tottenham Hotspur side of the early 1960s, memorably once put it: “The game is about glory. It’s about doing things in style, with a flourish, about going out and beating the other lot, not waiting for them to die of boredom.” It is matches like this that are remembered, not your latest Nike or Beats ad. 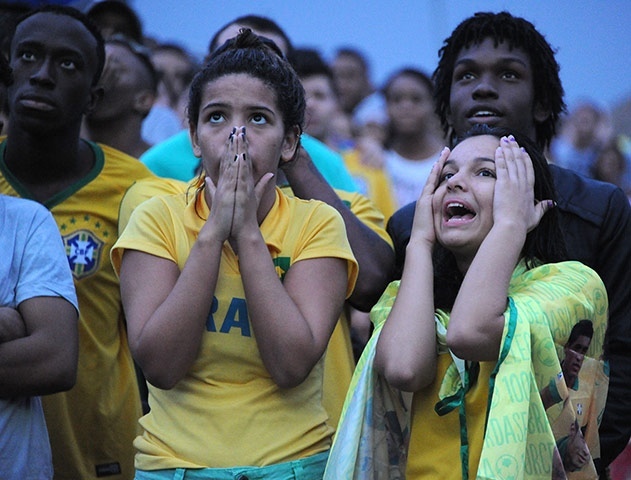 It may take time but Brazil and its football will recover from this. There have been, after all, five world titles since 1950. It will recover precisely and perversely because of nights like July 8, 2014. Except that now we all want to play like Germany, not Brazil. For us football fans, it’s been like waiting for Christmas but the FIFA World Cup is finally here with hosts Brazil kicking off against Croatia in Sao Paulo today. I’ll be flying to Brazil next week with my son Toby for what promises to be the football trip of a lifetime. We’ll be seeing six games, including England’s games against Uruguay and Costa Rica and two quarter-finals. During the trip I’ll be contributing a World Cup Diary to The Royal Gazette – you can read my first column here. Oh, and just in case you’re wondering, Argentina will beat Brazil in the final.